ArcSoft is currently running a limited time promotion for their Total Media Theatre 5 Blu-ray 3D player software with $40 off, and thus you can get it for $59.99 instead of the regular $99.99 USD price. 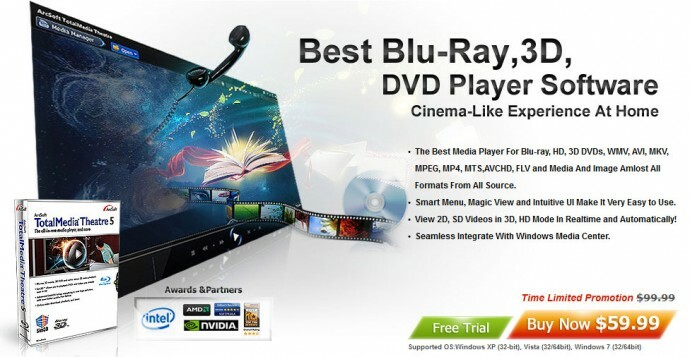 So if you were considering a purchase of a software Blu-ray 3D playback solution, then now might be the right time to take advantage of this offer and get TMT5. Corel is also currently running a promotion for their WinDVD Pro 11 software Blu-ray 3D software, so you cal also get it for $59.99 instead of the regular price of $79.99. Meanwhile PowerDVD 12 Pro with Blu-ray 3D playback currently costs $79.95 and Cyberlink is also currently running a promotion for the Ultra version of PowerDVD 12, so you can get it for $84.95.